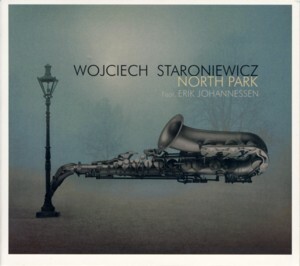 This is an album by veteran Polish saxophonist / composer Wojciech StaroniewiczFind albums by this artist recorded in a classic quintet setting with vibraphonist Dominik BukowskiFind albums by this artist, bassist Pawel UrowskiFind albums by this artist and drummer Przemyslaw JaroszFind albums by this artist and Norwegian trombonist Erik JohannessenFind albums by this artist. The album presents eight original compositions all by Staroniewicz. The music was recorded at the excellent Monochrom Studio and offers wonderful sound quality, as expected, and was released on AllegroFind albums on this label Records, an independent record label owned by Staroniewicz, which since over two decades releases Polish Jazz albums recorded by musician living in the Baltic Pomeranian region. The music, although melody based and mainstream oriented, offers a specific sound and atmosphere, which is somewhat similar to Scandinavian / Nordic Jazz and quite distant from typical Polish Jazz. The pianoless quintet, which uses vibraphone as the harmonic instrument and the presence of the dominant trombonist all have a decisive influence on the music, which offers a darkish, somewhat distant atmosphere and ambience, which is very effective. Combined with the characteristic compositions, which Staroniewicz is famous for since many decades, the music manages to create a unique and very startling overall impression. All five musicians are of course highly skilled professionals, who know exactly what needs to be played at any given moment and their interplay is absolutely perfect for this music, which needs attentive listening in order to get familiar with all its intricacies and has a distinctive effect of growing on the listener with consecutive listening sessions. Personally the impressive bass parts by Urowski as some of my favorite moments on this album, but to be fair it is full of great playing from start to finish. Overall this album is a wonderful example of the incredible diversity of the Polish Jazz scene, even within the mainstream genre itself. Staroniewicz, as usual, deservers praise for doing his own thing and ignoring fads and fashions. His lifetime commitment to excellence is admirable. This is highly interesting and challenging music, which deserves to be heard!